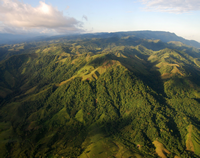 LA MACARENA, Colombia -- Seen from the air, the sweeping mountains of the Macarena jungle in Colombia's southern province of Meta stretch interminably towards the hazy horizon. The muddy Guayabero River snakes through this green land of deep canyons and forested valleys. It is here that Colombia's largest guerrilla group, the Revolutionary Armed Forces of Colombia (FARC), clings to its last stronghold.